Perennial herb, up to 40cm tall (leaves), native to Europe; leaves broad lanceolate, appearing in spring with fruits (capsules); flower a narrow erect tube, pinkish to pale purple, appearing in autumn (crocus-like, but with 6 - not 3 - stamens and 3 simple stigmas). The extraction of C.autumnale seeds by supercritical carbon dioxide gave the alkaloids (mean total content 1.88%) colchicine (1.25%), 3-demethylcolchicine (0.17%) and colchicoside (0.45%). Solvent extraction (methanol/water 95:5) gave total alkaloids 1.87%, colchicine (1.20%), 3-demethylcolchicine (0.12%) and colchicoside (0.54%). The range of alkaloid contents [% of dry mass] in different parts of C.autumnale is described as (corms, leaves, flowers, seeds): colchicine (0.2-1.9, 0.02-1.4, 0.15-0.85, 0.14-1.2); demecolcine (0.18-0.37, 0.08, n.s., n.s. 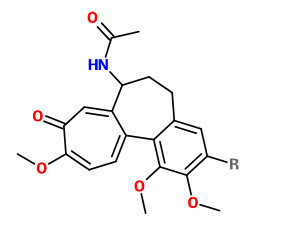 ), colchicoside (n.s., 0, 0, 0.1-0.48).